This is a slight revision to a layout plan posted in a forum, for a 5′ x 9′ HO layout. It suggests reconfiguring the yard in order to gain a useable engine house spur in one corner, along with slightly longer yard tracks. 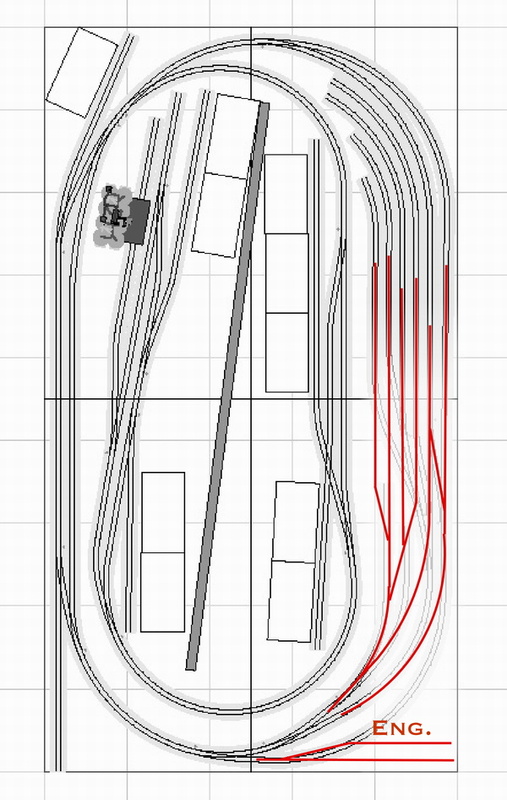 This was not confirmed with actual track geometry (such as in layout-planning software) but should be workable. The original version located a single-track engine house right about where the four yard tracks split. The operating conception of this layout is of a branch line or independent short line, which accepts traffic from a Class 1 interchange (the bottom left corner), sorts it in a small yard, then switches a number of industries on an out-and-back line. The mix of facing and trailing point spurs mean that the runaround at the end is critical, although the layout could survive without it since there is a runaround at the interchange which serves double duty. The local that departs the yard in a clockwise direction passes through this siding, even though technically the interchange is “behind” it, on the other side of the yard. The local could be forced to use this runaround as a way to block cars for the industries at the end of the line. Alternately, it could be that two locals are required out of the yard, one each for facing and trailing point customers. The revised engine house location affords more scenic room for the servicing, perhaps enough for a small depot or office. While there is no drill track and thus yard switching will foul the main, this seems fine for the small scale of the branch line. This could even be a one-engine line, in which case the engine house could be reduced to single-stall. I claim credit only for the track lines shown in red.